On Ruby’s thirteenth birthday, a wish she didn’t even know she had suddenly comes true: the couple who raised her aren’t her parents at all. Her real mother and father are out there somewhere, and Ruby becomes determined to find them. Venturing into the forest with nothing but a suitcase and the company of her only true friend—the imaginary Shadow Boy—Ruby discovers a group of siblings who live alone in the woods. The children take her in, and while they offer the closest Ruby’s ever had to a family, Ruby begins to suspect that they might need her even more than she needs them. And it’s not always clear what’s real and what’s not—or who’s trying to help her and who might be a threat. Told from shifting timelines, and the alternating perspectives of teenage Ruby; her mother, Anna; and even the Shadow Boy, The Doll Funeral is a dazzling follow-up to Kate Hamer’s breakout debut, The Girl in the Red Coat, and a gripping, exquisitely mysterious novel about the connections that remain after a family has been broken apart. My name is Ruby. I live with Barbara and Mick. They're not my real parents, but they tell me what to do, and what to say. I'm supposed to say that the bruises on my arms and the black eye came from falling down the stairs. But there are things I won't say. I won't tell them I'm going to hunt for my real parents. I don't say a word about Shadow, who sits on the stairs, or the Wasp Lady I saw on the way to bed. I did tell Mick that I saw the woman in the buttercup dress, hanging upside down from her seat belt deep in the forest at the back of our house. I told him I saw death crawl out of her. He said he'd give me a medal for lying. I wasn't lying. I'm a hunter for lost souls and I'm going to be with my real family. And I'm not going to let Mick stop me. Kate Hamer grew up in the West Country and Wales. She studied art and worked for a number of years in television and radio. In 2011 she won the Rhys Davies Short Story Prize and her short stories have appeared in many collections. Her novel THE GIRL IN THE RED COAT was published in the UK by Faber & Faber, in the US by Melville House and has been translated into 17 different languages. It was shortlisted for The Costa First Novel Prize, the British Book Industry Awards Debut Fiction Book of the Year, The John Creasy (New Blood) Dagger and the Wales Book of the Year. It was a Sunday Times bestseller. 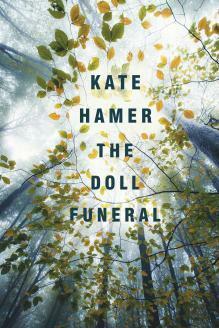 Her new novel THE DOLL FUNERAL has been a Radio4 Open Book editor's pick and a Bookseller Book of the Month. Susan Roberts lives in North Carolina when she isn't traveling. She and her husband enjoy traveling, gardening and spending time with their family and friends. She reads almost anything (and the piles of books in her house prove that) but her favorite genres are Southern fiction, women's fiction, and thrillers. Susan is a top 1% Goodreads Reviewer. You can connect with her on Facebook, Goodreads or Twitter.